Chris James and Steve James review research on the storage of foods in the temperature region between 0°C and -12°C. The drive to maximize the storage and display lives of perishable foods has led to increasing interest in holding foods in the region between their freezing point and -12°C. This is a grey area in terms of much International legislation, since food is not usually considered fully ‘frozen’ until it is below -12°C and only considered ‘chilled’ above its freezing point. The terms ‘super-chilled’, ‘deep-chilled’, ‘ultra-chilled’ or ‘partially-frozen’ are often used for foods held in this temperature region; the Japanese also use the term ‘Hyo-on’. Confusingly some in the Food Industry also use similar terms for chilled foods that are simply held below 0°C, or use the terms ‘super-chilling’, ‘deep-chilling’ or ‘hard-chilling’ for the process of using refrigerating temperatures below 0°C (also commonly referred to as ‘rapid’ or ‘ultra-rapid’ chilling). Where freezing occurs during the process before equalising at the required storage temperature terms such as ‘crust-freezing’ and ‘partial-freezing’ may also be used. Partial-freezing is often used to aid the cutting of foods, by making the product rigid, but not hard, and thus easier to cut. This process is often know as ‘tempering’. To yet further confuse matters some foods can be held significantly below their freezing point without freezing (i.e. nucleation of ice crystals), this is usually referred to as ‘sub-cooled’ or ‘super-cooled’. Typically the aim of super-chilling is to store food products at temperatures just below their initial freezing point; low enough to substantially reduce bacterial activity but high enough to avoid significant levels of ice crystal growth that can cause structural damage. For typical foodstuffs such as fish, meat and vegetables these temperatures are often in the range -1°C to -7°C, at which (depending upon composition) about 10 to 50% of water in the product is ice. According to Aune (2003) one of the first applications of super-chilling was the patent of Le Danois, (1920) which describes the preservation of fish by immersion in isotonic solutions with seawater at a temperature close to the freezing point (-4°C). The fish was then dipped into fresh water to freeze a layer of ice onto its outside surfaces. Storage in cold rooms at various temperatures then followed, with shelf lives of 15 to 40 days at -2 to -4°C and behaviour at -8°C similar to frozen i.e. shelf lives of several months. A few (relatively limited) literature reviews have been published on the subject of super-chilling and super-chilled storage; most of these are concerned with the storage of fish and other seafood (Waterman & Taylor, 1967; Carlson, 1969; Einarsson, 1988; Aune, 2003; Haugland et al., 2005; Gregersen, 2006). 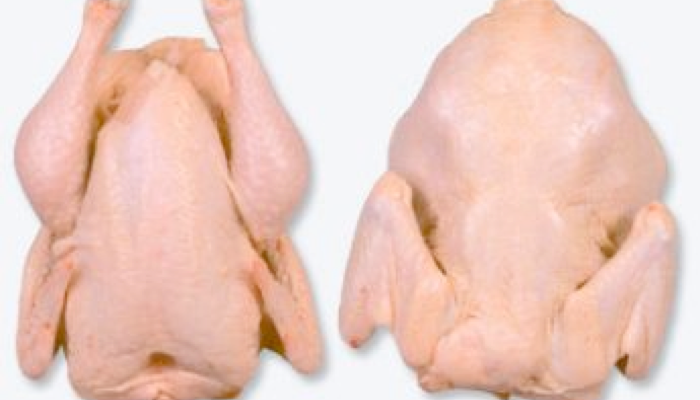 There is relatively little published data on the freezing point of poultry meat. It is generally recognised to be between -1.5 and -2°C, though as yet unpublished studies at FRPERC have measured a freezing point of approximately -1.3°C in the deep breast of standard UK carcasses. However in the USA -2.2°C is used (Sams, 2001) and a value as low as -2.8°C has been quoted (Pflug, 1957). 1974 Fish: Cod, -1 to -4°C. Shelf life 10 days at 0°C, 14 days at -1.6°C, >18 days at -4°C. Authors advocated freeze-chill system (Nowlan et al., 1974). 1981 Fish: Variety of species, -2°C. Shelf-lives of 15 to 20 days at -2°C (Ming, 1981). 1982 Poultry: Chicken, -2.2°C. Crust frozen then stored at -2.2°C for 4 days followed by 2°C for 10 days. Authors reported more retention of minerals than samples packed in ice for the same period (Ang et al., 1982). 1983 Fish: Minced Baltic Herring, -2°C. Maximum peroxide value exceeded after 2 days at +4°C and 10 days at -2°C. At -2°C water holding capacity decreased markedly in a few days, whereas at lower temperatures changes were slower (Lajolinna et al., 1983). 1983 Fish: Japanese anchovies. In a comparison of drip in frozen versus superchilled Japanese anchovies, no detectable drip was found in super-chiled samples, while copious amounts were found in samples previously frozen at -30°C (Kakuda & Uchiyama, 1983). 1984 Fish: Mullet, -2°C. Shelf life of fish was 7 days in ice at 0°C compared with 10 days in an ice mixture (either 2% NaCl- or 7% propylene glycol-ice) at -2°C. The extension of shelf life was attributed to delayed microbial growth and slower biochemical changes. Structural changes, as revealed by microscopic examination, due to ice crystals at subzero temperature storage appeared to be minor compared to those which occurred during freezing at -20°C (Lee & Toledo, 1984). 1984 Meat: Cured pork loin, -3.5°C. Shelf life of >56 days at -3.5°C (Bogh-Sorensen & Zeuthen, 1984). 1987 Fish: Cod, -3°C. There was less evidence of biochemical deterioration when stored at -3°C compared to 0°C. Interesting affect of season with the freezing point of muscle fluid from Newfoundland Atlantic cod being as low as -1.3°C in March and as high as -0.8°C in July (Simpson & Haard, 1987). 1988 Fish: Cod, crust freezing with -35°C air. Little difference in eating quality between conventionally chilled and crust frozen samples (Graham & Kelman, 1988). 1988 Fish: Tropical fish. Salt uptake by the flesh approximately 1% higher in fish super-chilled in salt/ice mixture, compared to regular ice storage, however, taste panelist found the flavor of the super-chilled fish to be superior to ice stored fish (Toledo-Flores, 1988). 1988 Shellfish: Shrimp, -3°C. Shelf-life of 8 days in ice at 0°C, 16 days at -3°C (Fatima et al., 1988). 1990 Poultry: Chicken, -2°C. Chicken remained edible up to 18 to 39 days at -2°C. Taste panel and instrumental analysis indicated it to be less tender than conventional, possibly due to delayed maturation (Kenny et al., 1990). 1991 Meat: Beef, -5°C. Indicated that for aerobic storage periods of 90 days, metmyoglobin levels of partially frozen samples upon thawing were comparable to those of frozen samples stored at -20°C. For vacuum-packaged beef, pigment concentrations remained practically constant during frozen storage; partial freezing increased oxygenation capacity of the tissue compared with chilled and frozen conditions (Lanari & Zaritzky, 1991). 1992 Potato: Partial freezing is a promising technique in producing good quality French fries, especially for potatoes stored for an extended period and containing large amounts of reducing sugars (Luna, 1992). 1992 Poultry: Broilers, -1°C. Extended shelf -life of carcasses by up to 4 days longer than that of conventional chilling (Smolinska & Abdulhalim, 1992). 1992 Fish: Striped Bass, -2°C. Shelf-life 8 days in oxygen permeable bags at 2°C, 21 days in “chillpack” in oxygen permeable bags at -2°C. Trained sensory panel found 21 day stored chillpack samples to be similar in flavor and aroma but of firmer texture than refrigerated samples stored 8 days (Boyd et al., 1992). 1995 Meat: Pork, -10°C then -3°C. The more the freezing at -10°C was prolonged, the more unfavourable were the changes in structure, WHC and tenderness. Deep chilling at -3°C after thawing of the experimental material, on the other hand, favourably affected the parameters measured (Szmanko et al., 1995). 1997 Poultry: Chicken, -2°C. Shelf-life 7 days at 4°C, extended by 3-4 days at 2°C, 4-5 days at 0°C, 10-11 days at -2°C, some micro (Sawaya et al., 1997). 1998 Fish: Sea bass, -3°C. Shelf life 3 days at 5°C, about 2 weeks at 0°C, > 4 weeks at -3°C (Chang et al., 1998). 1998 Fish: Salmon, -2 to -3°C. Study details theoretical and lab studies on achieving super-chilled temperatures using brine. Work quotes ice contents relationship, based on surprisingly high freezing point of -0.96°C (Nordtvedt et al., 1998). 1998 Meat: Beef, -2 to -3°C. Theoretical data on achieving super-chilled temperatures in beef (Magnussen et al., 1998). 1999 Fish: Salmon, -3.5 to -0.5°C. Salmon crust frozen to surface temperature of -2.0 to -3.5°C with core of -0.5°C. Salmon transported without ice for approximately 2.5 days with a core temperature of -1.4°C on arrival (Aune & Nordtvedt, 1999). 1999 Fish: Salmon, <-1°C. Shelf life 14 days at 0°C in ice, 20 days at <-1°C in CO2 enriched modified atmosphere (Sivertsvik et al., 1999). 1999 Meat: Beef, burgers, -2°C. Survival of Escherichia coli O157:H7 and nonpathogenic strain monitored in raw ground beef stored at 2°C for 4 weeks, -2°C for 4 weeks, 15°C for 4 h and then -2°C for 4 weeks, and -20°C. Numbers of the E. coli decreased by 1.9 and 1.4 log10CFU/g, respectively, in patties stored at 2°C, 1.5 and 2.8 log10CFU/g, respectively, in patties stored at -2°C. Numbers reduced by 2.7 and 1.6 log10CFU/g, respectively in patties stored at 15°C for 4 h prior to storage at -2°C for 4 weeks. Frozen storage (-20°C) resulted a 1 to 2 log10CFU/g reduction after 1 year (Ansay et al., 1999). 2001 Poultry: Chicken, -3°C. Sensory comparison of broiler breast meat stored at +4, 0, -3, -12, and -18°C for 2 and 7 days, differences in descriptive sensory texture and moisture characteristics could not be attributed to temperature, storage time or combinations of the two (Lyon et al., 2001). 2003 Shellfish: Shrimp, -1.5°C. Liquid ice storage at -1.5°C gave the longest shelf-life fort shrimp based on sensory analysis (Qingzhu, 2003). 2003 Fish: Salmon, -2°C. Shelf-life 7 days in air at 4°C, 10 days in MA at 4°C, 21 days in air at -2°C, 24 days in MA at -2°C (Sivertsvik et al., 2003). 2004 Shellfish: Shrimp, -2°C + sepia ink extracts. Shelf life extension of 10-days (Sadok et al., 2004). 2004 Fish: Artic Charr, -2°C. Shelf-life 10 days in dry ice (ratio of 150 g to 3 kg fish) at 3-4°C, 15 days in ice at -2°C, 16 days in dry ice (ratio of 150 g to 3 kg fish) at -2°C (Bao, 2004). 2004 Fish: Sardine, -1.5°C. Shelf-life 5 days in ice at 0°C, 12 days in slurry ice at -1.5°C, 15 days in ozonated slurry ice at -1.5°C (Losada et al., 2004). 2005 Meat/fish: Beef, beef burger, salmon, -2.0 to -4.8°C. Domestic storage under ‘ultra-chilled’ conditions (defined as -3 to -7°C). Limited data showed some advantage in quality of meats stored as low as -4.8°C (Sun et al., 2005). 2005 Meat: Roast Pork legs, -1.1°C. Blast chilled (crust frozen) in freezing tunnel (65 min, -30°C, 2 ms-1). Shelf life doubled, up to 35 days at -1.1°C. Calorimetric data quoted as showing 10% ice at -1.1°C, 35% ice at -2°C (Haugland et al., 2005). 2005 Shellfish: Shrimp, -1.5°C. Lowest counts were observed in shrimp stored in liquid ice at -1.5°C where the lag phase of growth was apparently extended at the beginning of storage (Zeng et al., 2005). 2006 Fish: Spotted Wolf-Fish, -1°C + MAP. Shelf-life 6-8 days in air at 4°C, 8-10 days in air at -1°C, 13 days in MA at 4°C, 15 days MA-packaged at -1°C (Rosnes et al., 2006). 2006 Fish: Cod, -1.5°C. Extended sensory shelf life for at least 3 days compared with traditional process, resulting in a total shelf life of 15 days (Olafsdottir et al., 2006). 2007 Fish: Cod, -2.2°C. In comparison with ice, showed increased shelf life with respect to reduced growth of sulphide producing bacteria and lower drip loss. However, liquid loss by low-speed centrifugation was higher compared to ice chilled (Dunn & Rustad, 2007). 2007 Fish: Yellowtail, -1.5°C. Could maintain fish-meat quality for longer periods than storage at -0.5, 1.0, or 4.0°C (Ando et al., 2007). 2007 Fish: Lightly salted salmon, -1°C. Super-chilled for 9 days behaved as salmon stored on ice for 2 days with regard to hardness, protein solubility and free amino acids. Highest yield of lightly salted salmon was from salmon super-chilled for 9 days followed by 9 days ice-chilled (Gallart-Jornet et al., 2007). 2008 Fish: Salmon, -1.4 and - 3.6°C. In comparison with ice, textural hardness significantly higher at -3.6°C than -1.4°C, ice chilled and frozen references, shelf life doubled at -1.4°C and -3.6°C compared to ice (Dunn & Rustad, 2008). Super-chilling has several potential advantages over conventional chilled and frozen storage, chief of which is the ability to extend food product storage life from days to weeks without having to suffer the detrimental quality effects caused by substantial ice crystal formation. It has also been claimed that the presence of ice crystals in super-chilled products could help to maintain acceptable temperatures throughout the chill chain by providing the equivalent of an ‘internal thermal reservoir’ (Aune, 2003). If the process makes freezing unnecessary for some products, it could possibly offer considerable energy savings by obviating the need for blast freezers and low temperature storage and display. Finally, super-chilled products could be merchandised more attractively by retailers in comparison with frozen equivalents. The phenomenon know as super-cooling (also referred to as ‘undercooling’ or ‘subcooling’) is where the temperature of a solution or material is reduced below its freezing point without crystallization occurring due to an energy barrier that must be surmounted before nucleation starts. When crystallization begins the temperature is raised to the freezing point. When ice crystallization occurs, there is a corresponding increase in temperature (due to the latent heat of ice crystallization) from the super-cooled temperature to the freezing point (Cox & Moore, 1997). The point at which nucleation is initiated may be referred to as the ‘nucleation point’ or ‘metastable limit temperature’ (Cox & Moore, 1997). Although supercooling has been studied in pure water and other liquids, where research has shown that water can supercooled as low as -70°C in atmospheric conditions (Jeffery & Austin, 1997), there is little published data on supercooling in solid foodstuffs. The IIR Recommendations for the Processing and Handling of Frozen Foods (IIR, 2006) for instance states that ‘in the freezing of most foods supercooling is negligible’, though it does refer to its use in the manufacture of ice creams. A number of novel freezing systems also use super-cooling, by subjecting the target product to low-intensity magnetic fields (such as in Cells Alive System (CAS) developed by the Japanese company ABI Co Ltd) or high pressure (Urrutia et al., 2007), to achieve the uniform and rapid ice formation throughout the product. References to supercooling in foods are spread far and thin, most being in regard to fruits and vegetables. Many of these published studies regarding supercooling in fruits and vegetables have been concerned with these phenomena in growing plants (Pearce, 2001) and its role in frost damage and frost resistance. As early as the 1920s, Diehl (1924) reported that isolated apples could sometimes be cooled to a point as low as 7 or 8 degrees below their freezing point (4°C of supercooling) without ice formation, provided the fruit was left undisturbed. Lucas (1954) cited other early studies showing 3°C and 1.5°C of supercooling in grapes and navel oranges, while his own study, in 1954, on lemons reported nucleation points of between -3.9 and -4.4°C in whole fruits cooled in air, while a nucleation point of -6.1°C was reported in whole lemons cooled in alcohol. Supercooling of tomatoes was used as an example in a more recent patent on a process for supercooling by Cox & Moore (1997). Two individual, unreplicated, trials showed that two fresh tomatoes had nucleation points of -4.3 and -4.5°C. In a separate experiment no evidence of ice crystallization was apparent on visual inspection of the interior of a tomato cooled to an internal temperature of -3.8°C in a ‘water’ bath at -4°C. Fuller & Wisniewski (1998) measured ten independent nucleation events on the surface of a cauliflower curd cooled to -10°C at a rate of 15°Ch-1, ranging from -6.5°C to -9.5°C. Supercooling in frozen strawberries and its affect on ice crystal size and formation has been investigated by Martins & Lopes (2007). Their data showed a difference between nucleation and freezing point temperatures measured on the surface or centre of strawberries. Recent (as yet unpublished) studies at FRPERC have found significant, and surprisingly stable, super-cooling to occur in a wide variety of vegetables (such as garlic, shallots and cauliflower) and have demonstrated that some vegetables can be stored at temperatures significantly below their freezing point without freezing occurring. These super-cooled products should not be confused with ‘super chilled’ beverages. These are merely products kept a few degrees colder than similar products, generally below 0°C but above the products freezing point. Tempering is the process of taking a food product to a temperature where a substantial amount of the water in the product is in the form of ice but not all the water has turned to ice. This temperature must be below the freezing point and is usually between -5 to -2°C. At this state the product is rigid, but not hard, and thus easier to cut. The tempered product may either be cooled to this state from a temperature above the freezing point or warmed from a frozen temperature. Crust-freezing is often used for the same purpose, but is essentially a less controlled process where only the surface is frozen. This is fine for some products but tempering to a uniform temperature and rigidity throughout is crucial for the yield of high quality undamaged slices in some products (James & James, 2001; Lammertz & Brixy, 2001). Ando, M., Mizuochi, S., Tsukamasa, Y. & Kawasaki, K. I. (2007) Suppression of fish meat softening by strict control of storage temperature. Fisheries Science. Vol. 73:3, pp705-712. Ando, M., Nakamura, H., Harada, R. & Yamane, A. (2004) Effect of super chilling storage on maintenance of freshness of kuruma prawn. Food Science and Technology Research. Vol. 10:1, pp25-31. Ando, M., Takenaga, E., Hamase, S. & Yamane, A. (2005) Effect of super-chilling storage on maintenance of quality and freshness of swordtip squid loligo edulis. Food Science and Technology Research. Vol. 11:3, pp355-361. Ang, C. Y. W., Hamm, D. & Searcy, G. K. (1982) Changes in nutrient content during chill-holding of ice-packed and deep-chilled broilers. Journal of Food Science. Vol. 47:6, pp1763-1766. Ansay, S. E., Darling, K. A. & Kaspar, C. W. (1999) Survival of Escherichia coli O157:H7 in Ground-Beef Patties during Storage at 2, -2, 15 and then -2°C, and -20°C. Journal of Food Protection. Vol. 62:11, pp1243–1247. Aune, E. J. & Nordvedt, T. S. (1999) An environmentally transport of salmon from Norway to France by means of super-chilling and a new packaging method. 20th International Congress of Refrigeration, IIR/IIF, Sydney, Australia. Volume IV, Paper 484. Aune, E. J. (2003) Superchilling of foodstuff, a review. 21st International Congress of Refrigeration, IIR/IIF, Washington, US. ICR0127. Bao, H. N. D. (2004) Effects of dry ice and superchilling on the quality and shelf life of Arctic Charr (salvelinus alpinus) fillets. The United Nations University - Fisheries Training Programme, Hafrannsóknastofnunin - Marine Research Institute, PO Box 1390, Skúlagata 4, 120 Reykjavík, Iceland. Bogh-Sorensen, L. & Zeuthen, P. (1984) The validity of the TTT-concept on the shelf lives of chilled, cured meat products. Proceedings of the European Meeting of Meat Research Workers, 30, Section 5:5, pp223-224. Boyd, L. C., Green, D. P. & Lepors, L. A. (1992) Quality changes of pond-raised hybrid Striped Bass during chillpack and refrigerated storage. Journal of Food Science. Vol. 57:1, pp59–62. Chang, K. L. B., Chang, J. J., Shiau, C. Y. & Pan, B. S. (1998) Biochemical, microbiological, and sensory changes of sea bass (lateolabrax japonicus) under partial freezing and refrigerated storage. Journal of Agricultural and Food Chemistry. Vol. 46:2, pp682-686. Diehl, H. C. (1924) Freezing injury of apples. Journal of Agricultural Research. Vol. 29, pp0099-0127. Duun, A. S. & Rustad, T. (2007) Quality changes during superchilled storage of cod (gadus morhua) fillets. Food Chemistry. Vol. 105:3, pp1067-1075. Duun, A. S. & Rustad, T. (2008) Quality of superchilled vacuum packed Atlantic salmon (salmo salar) fillets stored at -1.4 and -3.6°C. Food Chemistry. Vol. 106:1, pp122-131. Gallart-Jornet, L., Rustad, T., Barat, J. M., Fito, P. & Escriche, I. (2007) Effect of superchilled storage on the freshness and salting behaviour of Atlantic salmon (salmo salar) fillets. Food Chemistry. Vol. 103:4, pp1268-1281. Graham, J. & Kelman, J. H. (1988) Quick chilling of prepacked fish products. Refrigeration for Food and People, Meeting of IIR Commissions C2, D1, D2/3, E1, Brisbane (Australia), pp140-145. Gregersen, F. (2006) Even longer shelf life. Fiskeriforskning Info, no. 11. Haugland, A., Aune, E. J. & Hemmingsen, A. K. T. (2005) Superchilling - innovative processing of fresh food. EuroFreeze 2005: Individual Quick Freezing of Foods, Proceedings of EU Workshop (Project QLK1-CT-2002-30544), 13-15 January 2005, Sofia, Bulgaria, pp1-8. IIR (2006) Recommendations for the Processing and Handling of Frozen Foods. IIR, Paris. James, S. J. & James, C. (2002) Meat Refrigeration. Woodhead Publishing Limited, ISBN 1 85573 442 7 1-347. Jeffery, C. A. & Austin, P. H. (1997) Homogeneous nucleation of supercooled water: Results from a new equation of state. Journal of Geophysical Research. Vol. 102, pp25269-25279. Jul, M. (1986) Chilling broiler chicken: an overview. Recent advances and developments in the refrigeration of meat by chilling, Meeting of IIR Commission C2, Bristol (UK), pp133-43. Kenny, T., Sorensen, L. B., Honikel, K., Mustranta, A. & Gormley, R. (1990). Inter-laboratory study of effects of deep chilling compared to conventional chilling on quality of broiler chicken. In: Processing and quality of foods Vol. 3: Chilled foods: the revolution in freshness, (Edited by Zeuthen, P., Cheftel, J. C., Eriksson, C., Gromley, T. R., Linko, P., Paulus, K.), 3.80-3.84. Lajolinna, P., Laine, J. & Linko, P. (1983) Quality changes in minced fish during cold and frozen storage. In: Processing and quality of foods (Edited by Zeuthen, P., Cheftel, J. C., Eriksson, C., Gromley, T. R., Linko, P., Paulus, K.), Elsevier Applied Science Publishers Ltd.
Lammertz, M. & Brixy, N. (2001) Continuous process and production improvements by application of refrigeration with cryogenic gases. Rapid Cooling of Food, Meeting of IIR Commission C2, Bristol (UK) Paris: International Institute of Refrigeration, ISSN 0151-1637 ISBN 2-913149-23-5, pp119-126. Lanari, M. C. & Zaritzky, N. E. (1991) Effect of packaging and frozen storage-temperature on beef pigments. International Journal of Food Science and Technology. Vol. 26:6, pp629-640. Le Danois, E. (1920) Nouvelle méthode de frigorification du poisson. French Patent No. 506.296. (Cited by Aune, 2003). Lee, C. M. & Toledo, R. T. (1984) Comparison of shelf life and quality of mullet stored at zero and subzero temperature . Journal of Food Science. Vol. 49:2, pp317-322. Losada, V., Barros-Velázquez, J., Gallardo, J. M. & Aubourg, S. P. (2004) Effect of advanced chilling methods on lipid damage during sardine (Sardina pilchardus) storage. European Journal of Lipid Science and Technology. Vol. 106:12, pp844-850. Luna, J. A., Garrote, R. L., Cardona, A. & Jeusette, J. P. (1992) Mathematical-modeling of the diffusion of ascorbic-acid during water blanching of surface frozen potato strips. International Journal of Food Science and Technology. Vol. 27:6, pp653-660. Lyon, B. G., Windham, W. R., Lyon, C. E. & Barton, F. E. (2001) Sensory characteristics and near-infrared spectroscopy of broiler breast meat from various chill-storage regimes. Journal of Food Quality. Vol. 24, pp435-452. Magnussen, O. M., Nordtvedt, T. S. & Torstveit, A. K. (1998) Use of Partial Freezing in the cold chain. Refrigeration Science and Technology, Meeting of IIR Commissions B2 & C2, with D1 & D2/3, Sofia (Bulgaria), Paris: International Institute of Refrigeration, pp363-370. Ming, Z. (1981) Application of partial freezing technique on fishing vessels operating in the South China Sea. Advances in the Refrigerated Treatment of Fish, Meeting of IIR Commissions C2, D1, D2, D3, Boston (USA), pp259-264. Nordtvedt, T. S., Borresen, T. & Magnussen, O. M. (1998) Partial freezing of salmon fillets. Refrigerated Transport, Storage & Retail Display, Meeting of IIR Commission D2/3 with D1, Cambridge (UK), Paris: International Institute of Refrigeration, pp106-113. Nowlan, S. S., Dyer, W. J. & Keith, R. A. (1974) Superchilling - new application for preserving freshness of fish filets during marketing. Canadian Institute of Food Science and Technology Journal-Journal De L Institut Canadien De Science Et Technologie Alimentaires. Vol. 7:1, ppA16-A19. Olafsdottir, G., Lauzon, H. L., Martinsdottir, E., Oehlenschlager, J. & Kristbergsson, K. (2006) Evaluation of shelf life of superchilled cod (gadus morhua) fillets and the influence of temperature fluctuations during storage on microbial and chemical quality indicators. Journal of Food Science. Vol. 71:2, ppS97-S109. Pflug, I. J. (1957) Immersion freezing found to improve poultry appearance. Frosted Food Field 17. (Cited in Ashrae Refrigeration Handbook 1994 12.5). Qingzhu, Z. (2003) Quality indicators of northern shrimp (pandalus borealis) stored under different cooling conditions. The United Nations University, Fisheries Training Programme, Final project. Rosnes, J. T., Kleiberg, G. H., Sivertsvik, M., Lunestad, B. T. & Lorentzen, G. (2006) Effect of modified atmosphere packaging and superchilled storage on the shelf-life of farmed ready-to-cook spotted wolf-fish (anarhichas minor). Packaging Technology and Science. Vol. 19:6, pp325-333. Sadok, S., Abdelmoulah, A. & El Abed, A. (2004) Combined effect of sepia soaking and temperature on the shelf life of peeled shrimp penaeus kerathurus. Food Chemistry. Vol. 88:1, pp115-122. Sams, A. R. (2001) Poultry Meat Processing. New York: CRC Press. Sawaya, W. N., AbuRuwaida, A. S., Dashti, B. H., Hussain, A. J. & Al Othman, H. A. (1997) Marketing of eviscerated broiler carcasses under supercooled conditions. Fleischwirtschaft. Vol. 77:4, pp365-371. Sivertsik, M., Nordtvedt, T. S., Aune, E. J. & Rosnes, J. T. (1999) Storage quality of superchilled and modified atmosphere packaged wholesale salmon. 20th International Congress of Refrigeration, IIR/IIF, Sydney, Australia. Volume IV, Paper 490. Sivertsvik, M., Rosnes, J. T. & Kleiberg, G. H. (2003) Effect of modified atmosphere packaging and superchilled storage on the microbial and sensory quality of atlantic salmon (salmo salar) fillets. Journal of Food Science. Vol. 68:4, pp1467-1472. Smolinska, T. & Abdulhalim, F. (1992) The effect of refrigeration method on meat quality and ultrastructural-changes in broiler carcasses stored at -1°C. Archiv Fur Geflugelkunde. Vol. 56:2, pp86-90. Sun, S., Singh, R.P., & O’Mahony, M. (2005) Quality of meat products during refrigerated and ultra-chilled storage. Journal of Food Quality. Vol. 28:1, pp30-45. Szmanko, T., Honikel, K. O. & Hofmann, K. (1995) Changes in histological structure and physicochemical properties of raw, cured, smoked pork loins resulting from freezing near cryoscopic temperature. Nahrung-Food. Vol. 39:5-6, pp432-451. Urrutia, G., Arabas, J., Autio, K., Brul, S., Hendrickx, M., Kakolewski, A., Knorr, D., Le Bail, A., Lille, M., Molina-García, A. D., Ousegui, A., Sanz, P. D., Shen, T. & Van Buggenhout, S. (2007) SAFE ICE: Low-temperature pressure processing of foods: Safety and quality aspects, process parameters and consumer acceptance. Journal of Food Engineering. Vol. 83:2, pp293-315. Waterman, J. J. & Taylor, D. H. (1967) Superchilling. Torry Research Note No. 32. Zeng, Q. Z., Thorarinsdottir, K. A. & Olafsdottir, G. (2005) Quality changes of shrimp (pandalus borealis) stored under different cooling conditions. Journal of Food Science. Vol. 70:7, ppS459-S466. Alemán, M., Kakuda, K. & Uchiyama, H. (1982) Partial freezing as a means of keeping freshness of fish. Bulletin of Tokai Regional Fisheries Research Laboratory. Vol. 106, pp11-25. Bilinski, E., Lang, G. & Tomlinso, N. (1966) Evidence for binding of oil in salmon canned after storage in ice or in a partially frozen condition. Journal of the Fisheries Research Board of Canada. Vol. 23:6, pp917-. Castell, C. H. & MacCallum, W. A. (1950) The value of temperatures close to freezing on the storage of fish. Journal of the Fisheries Research Board of Canada. Vol. 8, pp111-. Cox, N. A., Mercuri, A. J., Thomson, J. E. & Chew, V. (1976) Swab and excised tissue sampling for total and Enterobacteriaceae counts of fresh and surface-frozen broiler skin. Poultry Science. Vol. 55:6, pp2405-2408. Ehira, S. & Fujii, T. (1980) Changes in viable bacterial count of sardine during partially frozen storage. Bulletin of the Japanese Society of Scientific Fisheries. Vol. 46:11, pp1419-1419. Engler, P. P. & Bowers, J. A. (1975) Vitamin-b6 content of turkey cooked from frozen, partially frozen and thawed states. Journal of Food Science. Vol. 40:3, pp615-617. Fatima, R., Khan, M. A. & Qadri, R. B. (1988) Shelf-life of shrimp (penaeus-merguiensis) stored in ice (0°C) and partially frozen (-3°C). Journal of the Science of Food and Agriculture. Vol. 42:3, pp235-247. Fik, M., Surowka, K. & Leszczynskafik, A. (1988) Application of superchilling to prolong the keeping time of rainbow-trout. Nahrung-Food. Vol. 32:3, pp291-300. Freese, M. (1971) Case for accurate labeling of superchilled fish - comment. Journal of the Fisheries Research Board of Canada. Vol. 28:8, pp1217-. French, J. S., Kramer, D. E. & Kennish, J. M. (1988) Protein hydrolysis in coho and sockeye salmon during partially frozen storage. Journal of Food Science. Vol. 53:4, pp1014-. Gould, E. (1970) Case for accurate labeling of superchilled fish. Journal of the Fisheries Research Board of Canada. Vol. 27:11, pp2101-. Kato, N., Umemoto, S. & Uchiyama, H. (1974) Partial freezing as a means of preserving freshness of fish .2. Changes in properties of protein during storage of partially frozen sea bass muscle. Bulletin of the Japanese Society of Scientific Fisheries. Vol. 40:12, pp1263-1267. Kramer, D. E., French, J. S., Kennish, J. M., Schwartz, P. & McNeil, G. (1984) Biochemical-changes in pacific salmon muscle during storage at partial freezing temperatures. Canadian Institute of Food Science and Technology Journal-Journal De L Institut Canadien De Science Et Technologie Alimentaires. Vol. 17:3, ppR26-R26. Leblanc, R. J. & Leblanc, E. L. (1992) The effect of superchilling with CO2 snow on the quality of commercially processed cod (gadus-morhua) and winter flounder (pseudopleuronectes-americanus) fillets. In The effect of superchilling with co2 snow on the quality of commercially processed cod (gadus-morhua) and winter flounder (pseudopleuronectes-americanus) fillets. Huss, H. H., Jakobsen, M. and Liston, J.; Huss, H. H., Jakobsen, M. and Liston, J. pp115-124. Lee, Y. W. & Park, Y. H. (1985) Effect of partial freezing as a means of keeping freshness. I. Changes in freshness and gel forming ability of mullet muscles during storage by partial freezing. Bulletin of the Korean Fisheries Society. Vol. 18:6, pp529-537. Matyniak, J. & Ziolecki, J. (1983) Changes in some biochemical and physical characteristics of duck meat kept under deep-chilled storage. Fleischwirtschaft. Vol. 63:4, pp635-637. Merrit, J. H. (1965) Superchilling on board trawlers. Annex 1965-6, Bulletin of the International Institute of Refrigeration. No. 6, pp183-. Nowlan, S. S., Dyer, W. J. & Keith, R. A. (1975) Temperature and deteriorative changes in postrigor cod muscle stored up to 14 days in superchill range, -1 to -4°C. Journal of the Fisheries Research Board of Canada. Vol. 32:9, pp1595-1605. Okuzumi, M., Shimizu, M. & Matsumoto, A. (1981) Spoilage and bacterial-flora of thawed fishes, partially frozen at -3°c, during chill storage. Bulletin of the Japanese Society of Scientific Fisheries. Vol. 47:2, pp239-242. Okuzumi, M., Shimizu, M. & Matumoto, A. (1980) Changes in bacterial-flora of marine fish during the storage by partial freezing. Bulletin of the Japanese Society of Scientific Fisheries. Vol. 46:4, pp451-454. Partmann, W. (1965) Some experiences concerning superchilling of fish. Annex 1965-5, Bulletin of the International Institute of Refrigeration. No. 5, pp183-. Razavishirazi, H., Murata, M., Sakaguchi, M. & Kuwana, S. (1990) Influences of the partial freezing on torrymeter readings and k-values of yellowtail fillets. Nippon Suisan Gakkaishi. Vol. 56:5, pp835-835. Reed, R. J., Ammerman, G. R. & Chen, T. C. (1983) Chillpack studies on farm-raised channel catfish. Journal of Food Science. Vol. 48, pp311-. Roach, S. W., Tomlinso, N., Geiger, S. E. & Dollinge, E. (1966) Partial freezing as a means of preserving various species of groundfish. Journal of the Fisheries Research Board of Canada. Vol. 23:5, pp701-. Sawant, P. L. & Magar, N. G. (1961) Studies on frozen fish.1. Denaturation of proteins. Journal of Food Science. Vol. 26:3, pp253-. Smith, G. C. & Carpenter, Z. L. (1977) Systems for centralized pre-packaging of pork loin chops. Journal of Food Science. Vol. 42:6, pp1513-. Toma, R. B., Leung, H. K., Augustin, J. & Iritani, W. M. (1986) Quality of french fried potatoes as affected by surface freezing and specific-gravity of raw potatoes. Journal of Food Science. Vol. 51:5, pp1213-. Tomlinso, N, Geiger, S. E., Kay, W. W., Uthe, J. & Roach, S. W. (1965) Partial freezing as a means of preserving pacific salmon intended for canning. Journal of the Fisheries Research Board of Canada. Vol. 22:4, pp955-. Toyomizu, M., Hanaoka, K. & Nakamura, T. (1980) Lipid oxidation in the skin during storage of fish in the round at -5°C and susceptibility for lipid oxidation. Bulletin of the Japanese Society of Scientific Fisheries. Vol. 46, pp1011-. Uchiyama, H. & Kato, N. (1974) Partial freezing as a means of preserving fish freshness.1. Changes in free amino-acids, tma-n, atp and its related compounds, and nucleic-acids during storage. Bulletin of the Japanese Society of Scientific Fisheries. Vol. 40:11, pp1145-1154. Uchiyama, H., Kakuda, K. & Uchida, Y. (1984) Partial freezing as a new method for long period preservation of sea-urchin gonad. Bulletin of the Japanese Society of Scientific Fisheries. Vol. 50:5, pp839-843. Zhao, T., Ezeike, G. O. I., Doyle, M. P., Hung, Y-C and Howell, R. S. (2003) Reduction of Campylobacter jejuni on poultry by low temperature treatment. Journal of Food Protection. Vol. 66:4, pp652-655.